And from the look on his face, you ain't taking it from him either. Seems that Vestax have so much love for Mike that they made him a pair of clear cased PDXs called the "Skeleton Turntable". 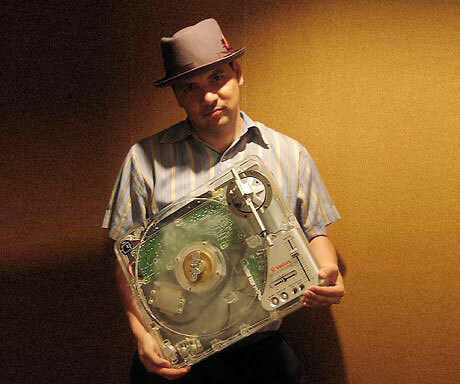 Time for an update on what Vestax have been doing to put themselves back on the map. We've had the new PDX-3000 in for a review which will appear soon, but it near stuff post PDX that we're looking at here. 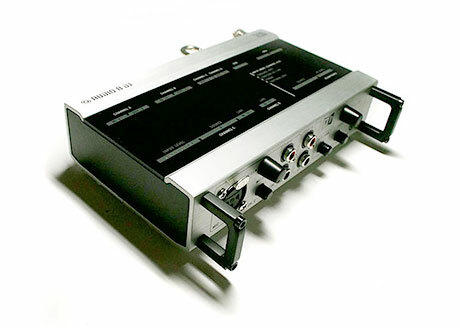 A new MIDI controller, a portable amp, a rackmount mixer plus tantalising hints at DVS oriented moves for the 05 and QFO. Archive C1 footage - how could I forget? The previous story prompted me about some completely forgotten about Controller One footage I shot nearly 2 years ago at PLASA 2005 - so I've just uploaded it to Youtube. If memory serves, it was the first time the C1 has been seen in public and was hooked up to a Yamaha QY100 sequencer, rocking beats and doing the MIDI thing. And it also had the footpedal being used, that seemingly never made it into production. Enjoy. For those of you who have patiently waited for demo movies from the creator of the Vestax Controller One, the wait is over. There are a full 5 movies of Ricci Rucker aka The Ruckazoid cutting it up fresh on the C1 on Youtube right now. No rest for the wicked and all that. Fresh on the (w)heels of the scratch universally acclaimed "Donkey Work", Awekid and DJ Muzzell have brought out the second chapter "Donkey Work II". Oh what the hell - let's give 2 copies away as well. New disks for DZ - but is prettier enough? It's not so often that you'll hear us (or anyone else for that matter) talk about the greatly anticipated but ultimately hated Technics SL-DZ1200. Oh how we hoped for great things from it, but sadly, it was considerably wide of the mark in so many ways. Arguably however, it really does win in one area - aesthetics. There's no doubting that the big wheeled silver beauty sets many hearts a poundin'. So it's a brave company that starts to make accessories for the DZ but Sensei Haus have done just that with their replacement for the frankly godawful plastic disks that Technics supply. Every time I post a story these days, it seems to be about the unstoppable rampage of the digital age, riding roughshod over the analog die-hards. And then I'll brag endlessly post a story about the latest hot battle wax than has made it's way to my door step. But what about battle wax for the new breed of scratchers out there? 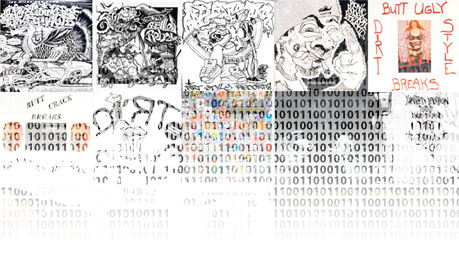 Sure you could convert your almost certainly battered and burned collection to MP3 but now you can get fresh versions of your favourite Dirtstyle and Needle Thrashers on MP3 straight from Thud Rumble. Native Instruments are currently rocking my world with Traktor Scratch, the review of which should appear next week (assuming no more natural disasters, house fires or subsequent back injuries). And much of this has been down to the somewhat gorgeous Audio8 interface. See it's not a closed proprietary box - it's a full on 8 in 8 out low latency USB2 sound card with ASIO, DirectSound and Core Audio drivers. And you can get one for yourself right now. As I've previously mentioned, everyone wants a piece of the VCI action. Some just want to make sure that the latest incarnation of their software runs just fine on Vestax's silver dream machine, whereas others need their very own custom VCI with custom body works, wheel trims and go-faster stripes. 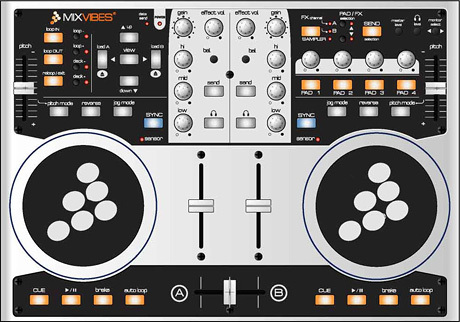 Mixvibes is one such company and bring you their own version of the VCI-100. How can we forget the recent international incident caused by the Woody/skratchworx Controller One unofficial promo movie. Such was the depth of feeling expressed by some that Vestax felt the need to clarify the situation with a brief but vitally important official statement. This is something that I ask for and wanted to make sure that they namechecked all the people they felt made a solid contribution to the final design, including Woody. Oh and there's another video on Youtube - all in Japanese but you'll get the idea. Big up Wakka for finding this. Vestax's VCI-100 is probably the hottest MIDI controller on the market right now and every self respecting software vendor is making sure that they get a piece the action. Realising this, Adion at DJDecks has released v0.82 of his software, adding full VCI compatibility. Another reminder - this time for the continuing series of free summer jams being put on by Tools of War. 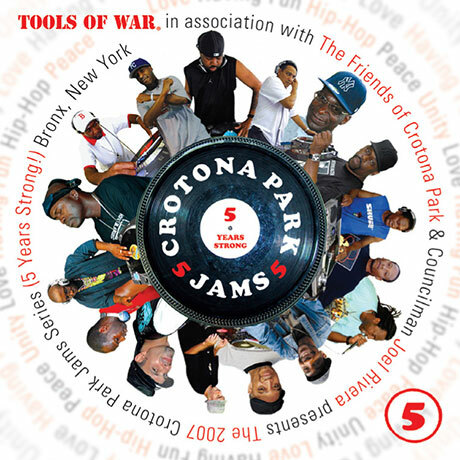 The Crotona Park Jams are now in their 5th year and will be happening every Thursday in July. Just a quick reminder for the UK massive about the upcoming Dj Show North, happening at Barnsley on 29th July - just a few weeks away. Conveniently located just off the M1, you can pop along and play with some hot DJ gear (probably hot though the lack of aircon in the old shed building), but really, it's just a nice day out in a nice place. From time to time, it's good to have a good clear out, dust down and fresh coat of paint right? 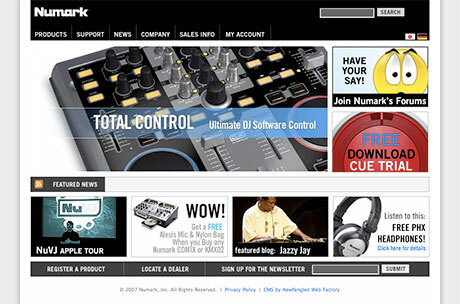 I think skratchworx is on v3 right now (check out archive.org for the first versions - actually don't) and Numark have finally got round to sprucing up their previously somewhat bland offering. The digital age has hit them big time and all sorts of media is popping up on there. Check out the iCDX page in particular for some niiice videos. M-Audio's Xponent - prolly doesn't take a Pro X Fade OK? Purveyor of flashing digital music things M-Audio are proud to announce the retail arrival of their new baby, named Xponent. Weighing in at �460/$750, this MIDI controller offers you the full Torq experience without having to drag archaic vinyl, decks and mixer out to a gig. I have no idea at this point if you can scratch on it, but then again I have no expectation of that anyway. 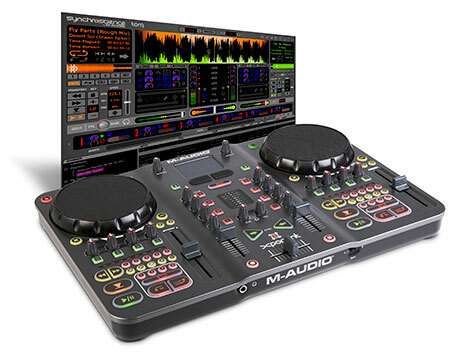 But what it does offer you is a real world tactile DJ experience with all the benefits of the Torq software. Shame it clashes soooo badly with my Powerbook.